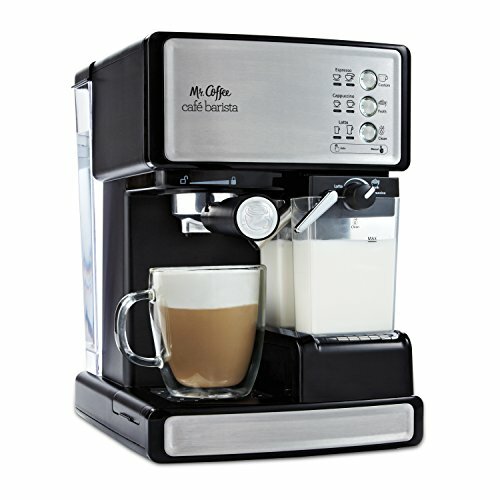 Do it yourself espresso, cappuccino, latte, milk frother, at home easy with, the Mr. Coffee Café Barista or the Breville Barista Express Espresso Machine with Grinder Review now. Coffee lovers enjoy their coffee and in fact simply cannot live without it paying a great deal of money for their daily cup of Joe. Recent taste test prove in home brews make a delicious cup of coffee comparable to the pricey coffee shops. You can have your coffee and brew it yourself just as good as the top coffee shops. A blind taste test between Starbucks caramel macchiato and that made in the Mr. Coffee Barista in Home Brewer won with coffee lovers choosing the home brew coffee every time. 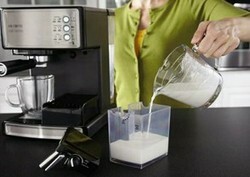 More and more coffee lovers are opting for the in home coffee barista for that amazing coffee house taste. Three personal reviews convinced me to try my own in home coffee Barista. I personally had 3 very good examples and comparisons while evaluating the purchase of my own in home barista. 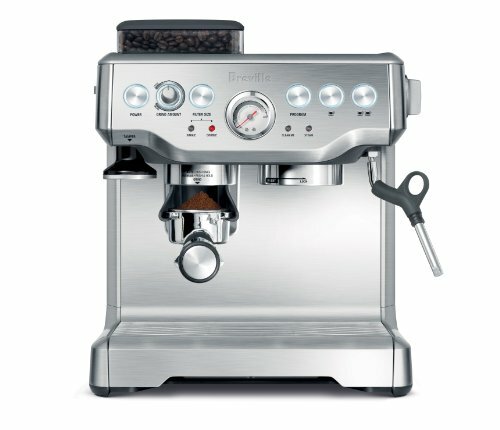 My sister’s husband bought her the pricey Breville Barista Express Espresso Machine with Grinder for $800.00 cold hard cash but she raves about it all the time. Frankly I got really tired of hearing her brag. I had sampled coffee from her pricey brewer over and over and it was very good but I just couldn't wrap my head around spending that much money. Once I crunched the numbers it proved to be a savings. I was now on the road to brewing my own specialty coffees. But it does make an amazing cup of coffee, latte, cap and all with that beloved frothy foamy texture I adore so much. Plus it has a grinder built in, it's just like the machine the use at Starbucks. I knew I had to have my own. My personal review of Starbucks, what it really cost them and what they charge the customers, us! I have a friend who manages a Starbucks. What I learned from him is this; you can brew your own coffee at home from the standard coffee brewer for about twenty cents on the dollar while any espresso based drink, like those made at Starbucks is twenty three cents on the dollar, their cost, not the mark up. Too Much! You can do the math yourself quickly noting the huge cost difference. My manager friend also invested in his own fancy Barista home brewer as did my sister. With the average cost of the Starbucks drinks we routinely enjoyed costing @ six bucks his brewer paid for its self in a few short months, he shared with me and other friends when we came for frequently came over for coffee. The Mr. Coffee Barista cost only $199.00 a great value. After three real life examples of coffee barista machines I was convinced it was a good purchase. Third example, another friend bought the Mr. Coffee Barista after we watched a comparison done on our local news station. Hmmmm you should bring that up in the forum. We need all the help we can get with net neutrality. katiem2, Back again and still loving it. Did you know that the scroll on your profile page -- and mine and everybody else I checked -- is not opening to list the topics? If I instead go to the food heading above one of your food/recipe wizzleys on your profile page, it draws up the general page of new wizzleys. That's nicely promotional for the new outputs, but I just want yours right now. DerdriuMarriner, Very good point, the mind boggles to think of the use, cleanliness etc. katiem2, Very nice! I can just smell the coffee that the home brewer turns out. It's possible that even though Starbucks follows rigorous cleaning schedules on their equipment that they can't keep up with the wear and tear from the volume of business and so that's one of the reasons why everyone preferred the home brew. kimbesa, Oh how I love mine. It's always a big hit with house guest and family gatherings. Plus if you have a party or gathering at your home and people ask what they can bring, you can always ask them to bring a box of their favorite k-cups to share. It's easy for them and you when you can't think of something. I'm thinking about something like this for a holiday gift. We might start drinking a lot more coffee if we had a good way to make a good cup at home! I would love having speciality coffee at home. I got the k cup type and don't like those at all. Brenda, I can't imagine life without great coffee, you think folgers is bad, have you ever drank Maxwell House??? I want one too. I love good coffee. When I moved to Kentucky, my mother and aunt were drinking Folgers. Yuck! That stuff is horrible.